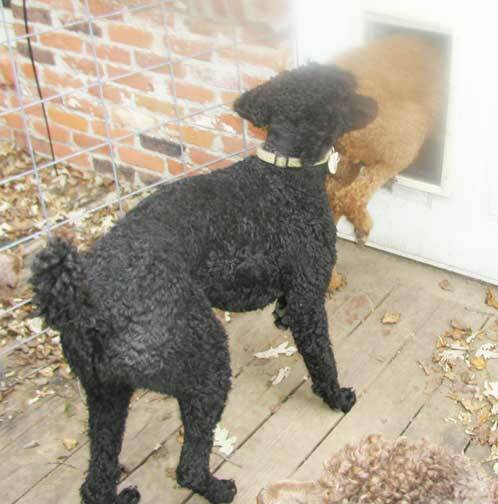 Standard Poodle Chiropractic Care; Bruno loved Dr. Mark's visits in MN! Now in TX, I've found Dr. Angela Stephens from Austin, TX who travels directly to my home to adjust all the parents and puppies monthly. Here I hope to help one understand the true science and technology of why Chiropractic Care and its VITAL usage with our pets. Dr. Mark in MN arrives to take care of the spoos. A. Good vss Bad...I am not going to write of good breeders/customers vss bad breeders/customers. I will write about Educated, Observing breeders/customers verses Unaware, Not Knowing What to Look for breeders/customers. One needs to Educate themselves, then OBSERVE! I hope I can help Educate and provide a point of Observation for those who want to learn here. B. In the many fields of healing, no matter how educated one is in that field, they observe, yet possibly haven't learned of another field that is just as healing. It is my hope one will observe and see for themselves here. C. I KNOW chiropractic care works as three decades ago (way before spoos were in my life) I was introduced to Chiropractic Care and found I had scoliosis, the curving of the spine. The next 5 years with consistent care my curve was gone - GONE! X-Rays showed the slow re-straightening of the spine...year after year. If I had not found a Gonstead chiropractor when I did, today my body would be deformed and debilitated from that worsening, continuing curving spine doing its damage to the body, nerves, and organs. Today I must continue to go weekly in order to keep it maintained and repaired from my challenging work I put on it. D. When I started to breed spoos, MN had not passed a law for chiropractors to work with small animals. After six years of breeding finally the MN law was passed and I found Dr. Mark LaVallie immediately who had already been working on large animals, as well as humans. One must have their human license in place, then learn for the animal realm. I know the results received for my own health, I had to establish my breeding spoos health now with chiropractic care to help them stay at the best structural health possible in bringing loving pets to the public. 1. Dr. Mark LaVallie arrives to care for Falcon after her having puppies. The dams pelvis are sometimes thrown out that they get bladder infections...and try caring for puppies when you're not feeling good! The re-alignment of their pelvis puts them to health within the week. 2. Every puppy gets an adjustment before they go to their new home. Examples of subluxations (pinching nerves) a) If their pelvis, male or female, is out they will get urinary track infections. b) If their atlas is out, they will get what I call ooey gooey eyes and possibly have headaches being irritated. c) If they're super hyper, their mid-spine is out, pinching them causing them to keep moving and overly active. When they are adjusted, healing occurs within the week. REALLY! 4. Here I am going to show images of my spoo parents to help one establish healthy structure: a) a great DVD on my Books & Links page is by Pat Hastings - http://www.dogfolk.com/ Again - here I share when one watches this DVD; to me I observe a missing link in the knowledge, that of chiropractic care that can correct an off puppy! Yet GREAT showing what to look for in healthy structured parents!! This PxD 14 month old offspring came back to me. 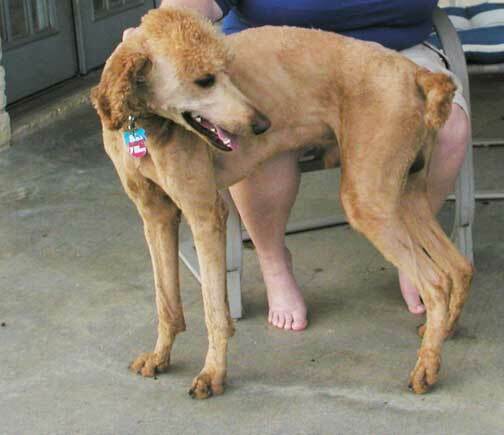 - I shaved all the hair off to observe what was underneath the longer coat to find an underweight, very mis-aligned pet that had taken the year to get to this point of deformity. 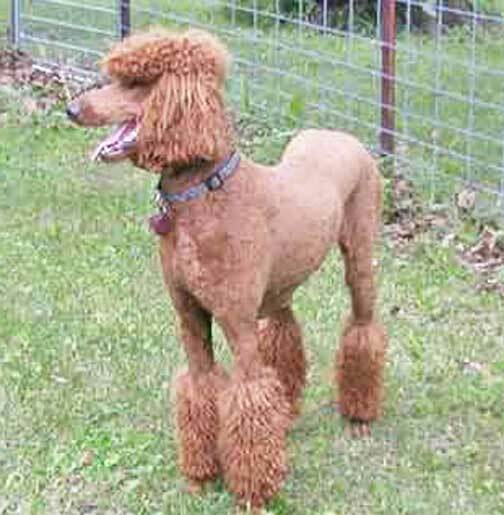 One could not observe this with a groomed long coat. 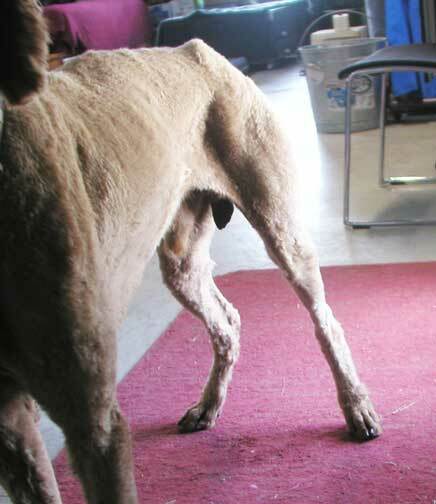 - Dr. Angela found his lower spine and pelvis torqued (twisted), causing him to be in constant pain which made him not want to eat, caused him to try to compensate by turning his legs and knees out to alleviate pain, which this caused him to arch his back causing the arched pinching back, which caused him to be irritated and hyper and wanting to bite if touched just so (first picture). - OBSERVE his *arched spine, see his *hind knees, legs and feet pointed out from the body to do his best to alleviate the pain. Observe he doesn't want to *stand on his left paw due to pain which one can see his left hip is higher then his right hip. 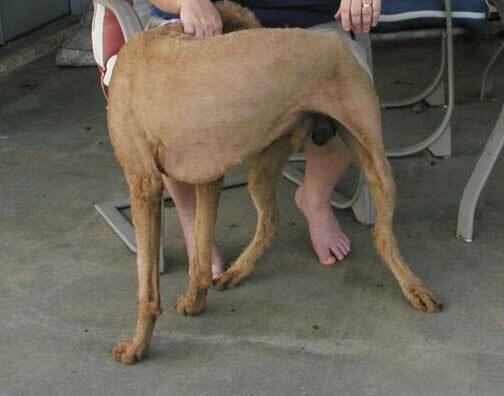 A week and a half later after adding canned dog food to the dry, we've been able to put some weight on him. - I explained to the new owners, showing them the pictures of his needed chiropractic care, every two weeks for a good 3 months, then adjust to what Dr. Angela observes. - I explained of his needed care for the rest of his life, that he may be able to get re-balanced to half of this...maybe. - BLESS these new owners!!! a) WHAT A Bad Breeder! b) WHAT A Bad Owner! a) You saw above pictures of parent Pickles and Daniel both parents healthy structure. 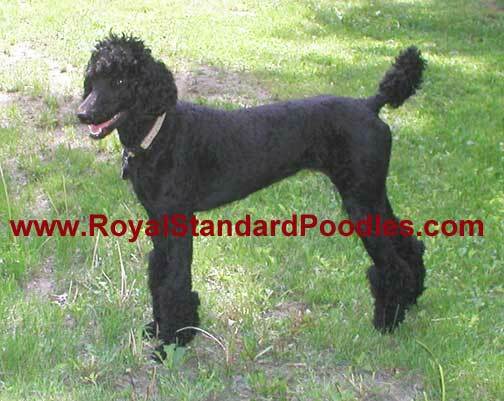 Breeder doing everything right for the health of her standard poodles - I Do more then most breeders. b) The owners had no knowledge of chiropractic care. Did not know what to look for, observe. - Thus I find the immediate addressing of Chiropractic Care for anyone looking at this web page! - SHARE this web page with others!! 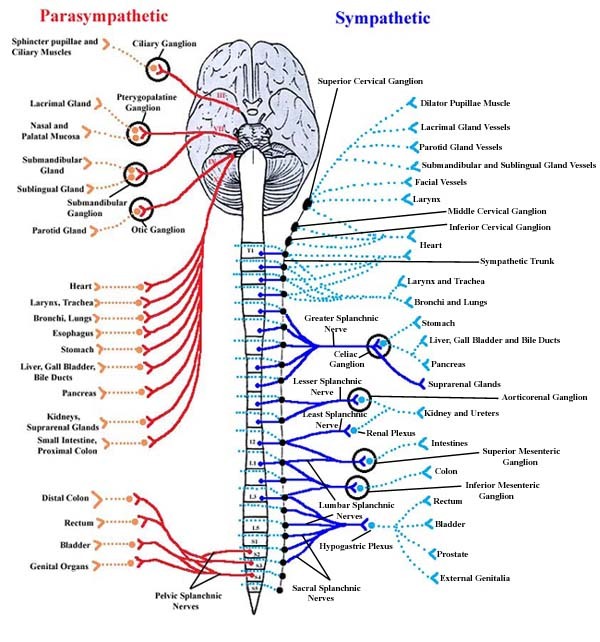 - Google and learn the science of Gonstead chiropractic care!!! One can save their health along with their pets. 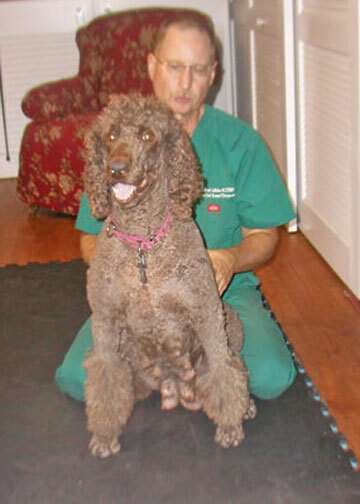 - Find a pet chiropractor to care for your pets! - Don't hesitate to call me with any questions you might have. * I hope to provide pictures in time of PxD care...we stay tuned...and say THANK YOU to all those individuals and families out there willing to care for such pets!! OBSERVE Grandma Fire's great structure under chiropractic care and Grandpa Bruno's excellent structure to pass on to Pickles. *Now you hopefully understand why I need to shave the spoos down, aside from heat, I need to be able to OBSERVE what is happening to their structure over the years. 7. 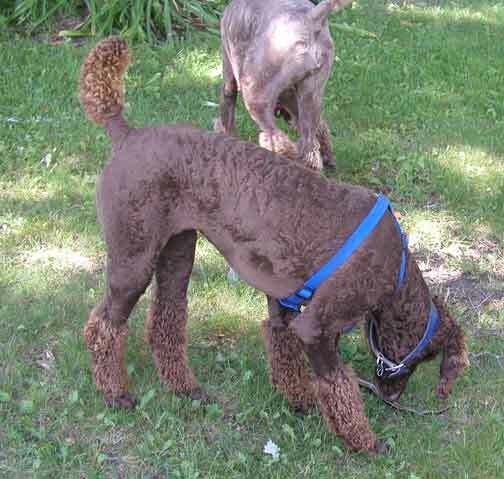 In MN Bruno slipped on the November ice as I watched his hind legs split underneath him blowing his pelvis totally out. That weekend Dr. Mark came to adjust the spoos and as I had suspected, now limping, he had blown his pelvis out. 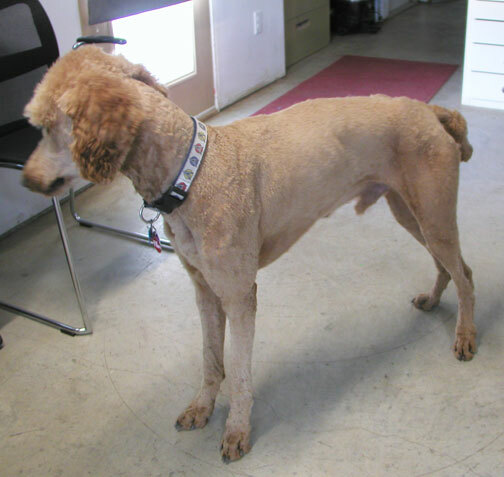 Most veterinarians would say he'd have to be neutered as he wouldn't be able to mate any more without severe pain. 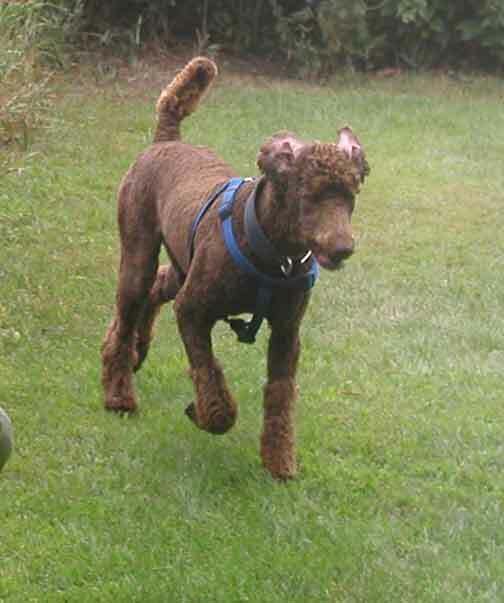 I took Bruno to the Twin Cities every two weeks for the next three months, then every 3 weeks until after 6 months he had healed where he was able to continue being that great stud he was. All due to Chiropractic care! Thank You Dr. Mark!! Home visits are available by appointment only. Travel fees apply. How Do I Know If My Pet Needs Chiropractic? This is by far the most frequently asked question that I get from pet owners. They go on to say, “They cannot tell you. Can they?” The fact is that your pets do tell you when they need help! You just need to know what to look for. 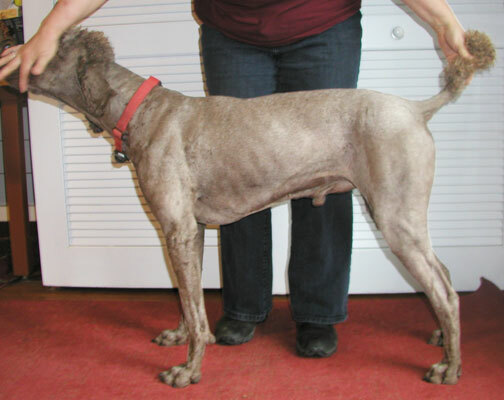 Following are three signs that your pet may benefit from a visit to the animal chiropractor. We have all observed how cats stand and stretch. It’s the first thing they do in the morning. Absence of this full, high-arching stretch is one of the first indications of a spinal or joint problem. The “shake” that dogs and some cats exhibit is frequently observed but not consciously appreciated by owners. 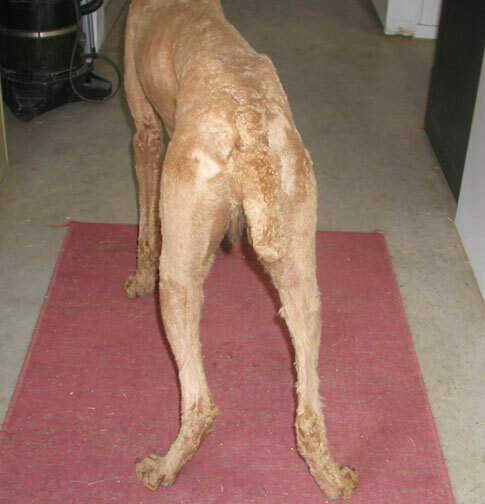 The shake that starts at the head and progresses without interruption through the lumbar and the tail is a healthy shake. 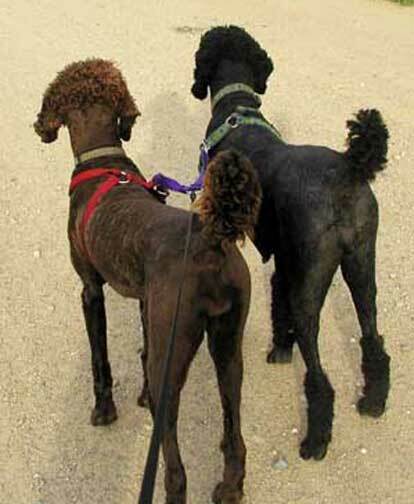 Dogs that stop a shake somewhere along the spine may be self-splinting a spinal or joint problem. The body’s protective reaction is to splint the area through muscle spasm, so as to prevent further injury. Through observation, touch, and massage, we can sometimes detect early signs of a treatable problem. When joints are damaged or injured, inflammation and swelling ensues. Significant swelling can often be seen and felt in the extremities, less often in the spine. A more common sign of inflammation in the spinal region is felt as heat or warmth in the tissues overlying the area. The easiest way to feel the heat is to take the back of your fingers and run them slowing down your pet’s spine, noting any significant differences in temperature. To heighten your sense of touch, close your eyes as you run your hand down the spine. Injured joints in the extremities also exhibit warmth when inflamed. Through touch and massage, you can also feel muscle spasms, or “hypertonic muscles.” Muscle spasms are a sign of the splinting action mentioned previously. 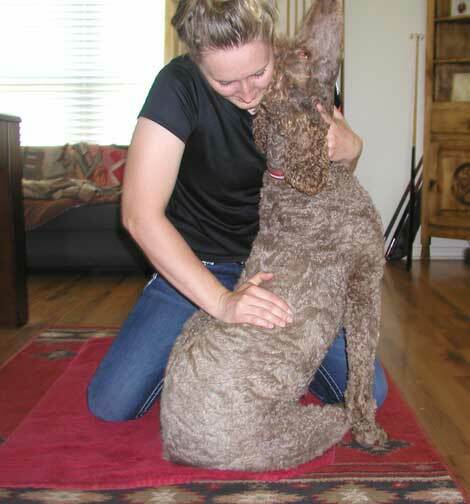 With dogs there is a simple and very useful test that provides early clues to nervous system dysfunction. 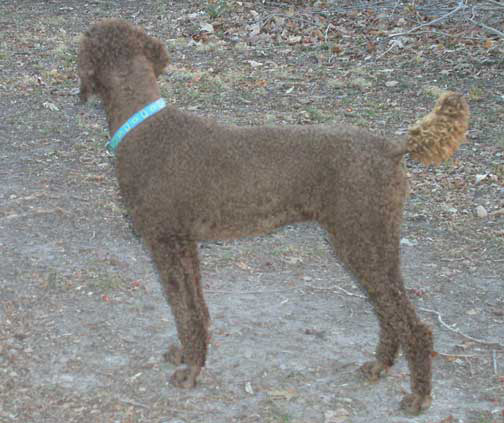 With your dog standing, flip over one paw so it is “knuckled over.” Repeat with the other paws. 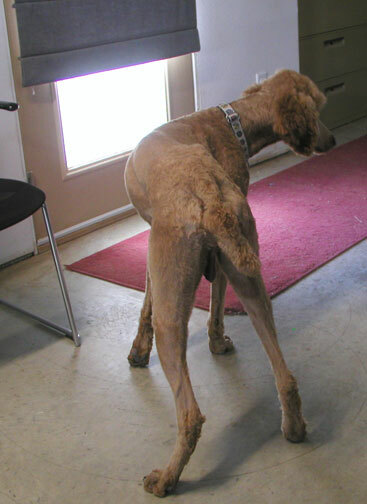 A normal reaction in a dog with a healthy nervous system is to immediately “flip” the foot back over to its normal position. If your animal takes longer than two seconds to flip its paw back, its “proprioception” or joint position sense, is compromised. Joint position sense is the brain’s ability to know where the limbs are at all times. 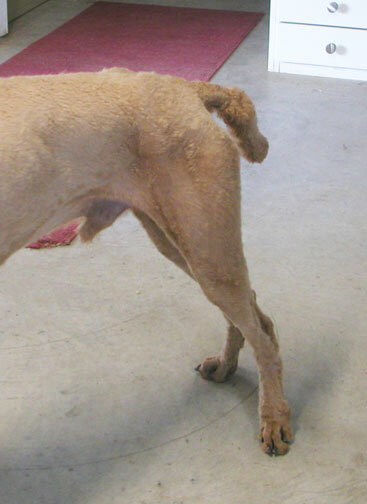 When a dog has spinal problems, this sensation is the first to go. Your doctor will typically refer to this sensation as “C.P.” Ideally, you should test your pet’s C.P. at least once per month after the age of two. It’s extremely important to understand that all of the above signs typically go unnoticed by most owners. But these signs precede more severe signs and symptoms of pain and weakness. By the time I first see many animals, their condition has already progressed to weakness, paralysis of a limb or multiple limbs, gait abnormalities, severe pain, and often loss of bowel and bladder control. While a vast majority of these animals respond effectively to chiropractic and veterinary intervention, the earlier the treatment begins, the better the prognosis. In a perfect world, our goal is to prevent these problems from occurring in the first place. 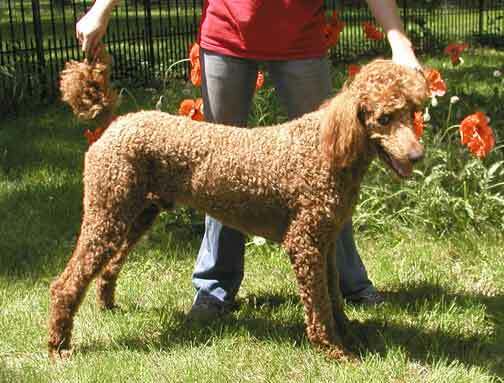 Prevention is a primary goal of many pet owners that have working or performance dogs, show dogs, or have breeds with a hereditary predilection to various maladies. Dachshunds, for instance, have a very high predisposition to thoraco-lumbar disc herniations. German shepherds are prone to hip dysplasia and “degenerative myelopathy.” Small breeds are often susceptible to “luxating patellas.” Labrador retrievers, due to the way they grasp a fetched object, are prone to upper cervical and jaw problems. 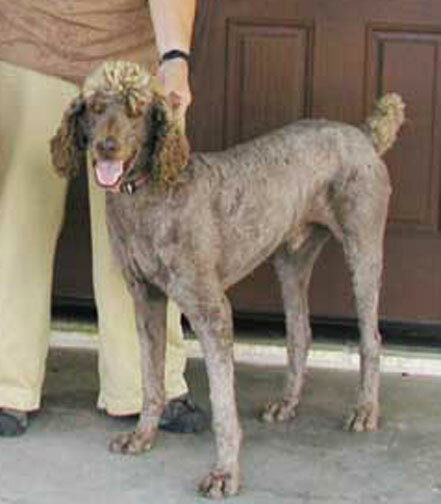 With any breed, prevention and early detection is the key. The next issue of The Talebone will answer frequently asked questions regarding animal chiropractic. In future editions, we will discuss specific conditions, prevention, treatment, stretching, and exercise programs, and other topics. Until next time, wishing you and your four-legged friend the best of health. Lacey the dog couldn't stop limping. A car had run over her, cracking the ball of her hip. 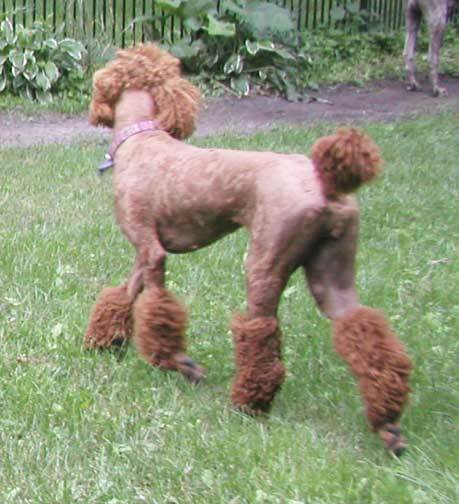 After surgery, she still walked gingerly. 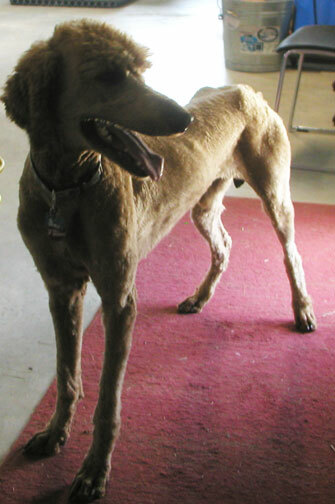 So her owner, Lisa Cottrell of Wyoming, Minn., took Lacey to an animal chiropractor, Dr. Mark LaVallie. 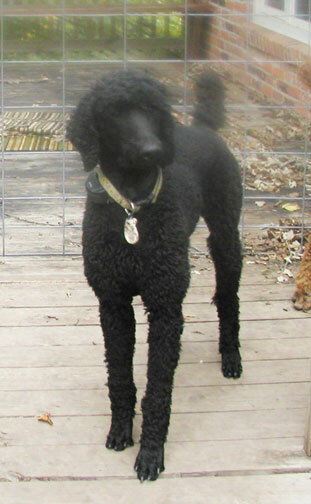 He adjusted the pelvis and lower spine of the black Lab-collie mix. Cottrell said the limp disappeared: "It was remarkable, like night and day." Now Lacey has $45 adjustments every six to eight weeks. She joins a growing number of dogs, cats, horses, cows and even llamas being treated by animal chiropractors in Minnesota. In July 2008, the state became one of the first to pass a law allowing chiropractors who work on people to also work on animals, as long as they get specialized training and meet other requirements. 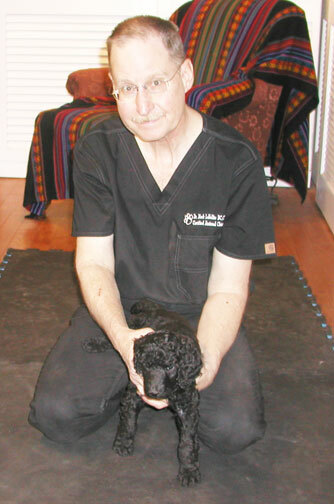 There's growing demand for such alternative therapies for animals, said Larry Spicer, executive director of the Minnesota Board of Chiropractic Examiners. That agency licenses chiropractors for humans and registers those who complete 210 hours of additional training so they can treat animals, too. LaVallie splits his practice 50-50 between humans and animals. 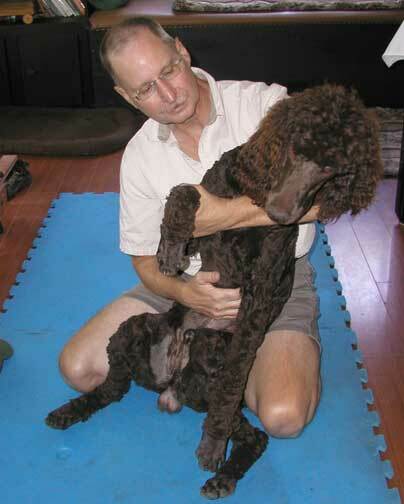 He's the busiest among 18 animal chiropractors registered in Minnesota. Nationwide, there are about 1,800 animal chiropractors, according to officials with Options For Animals, the biggest of three U.S. schools for animal chiropractic, said Robbie Hroza, administrator of the Wellsville, Kan., school. 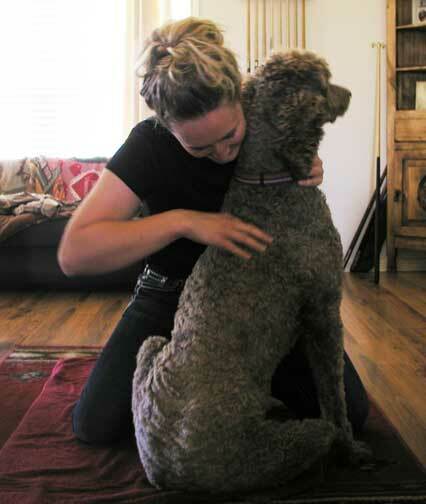 "In the last five years, it seems like a lot more people are going to a holistic approach with chiropractors -- in conjunction with the veterinary care, because you still need that," Hroza said. Minnesota's law was designed to require a veterinarian's referral to go to a chiropractor to ensure that the animal has no disease a human can get, such as rabies, and that it received proper veterinary care, said Dr. Trevor Ames, dean of the University of Minnesota College of Veterinary Medicine. Students there can take elective courses in animal chiropractic care. Does chiropractic care work for animals? Ames said there's no scientific proof because there have been no clinical trials yet. Get your Dog Chiropractor care! For Vernette Karwoski of Scandia there's no question. She's among advocates who pushed for the law to be changed in Minnesota, in part because she had to drive to Wisconsin to take her dogs to an animal chiropractor. On a recent morning on Karwoski's farm, she held the head of each of her four llamas steady while LaVallie adjusted them, along with a sheep and two dogs. It was the llamas' first treatment. They flicked their ears and licked their lips, relaxing as he worked. LaVallie found vertebrae that he said had become stuck in place in their long necks, in their pelvises and in sacroiliac joints. 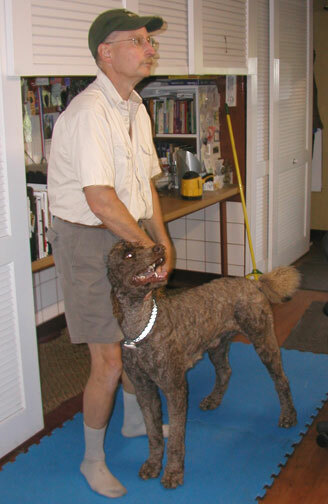 LaVallie, of St. Croix Falls, Wis., has been a chiropractor for humans for 30 years. After Minnesota changed its law, he studied at the Healing Oasis near Racine, Wis., so he could work on animals, too. Since February 2009, he's adjusted about 1,200 animals, LaVallie said. 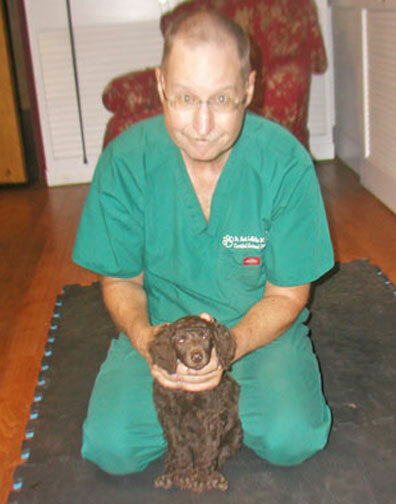 He travels around, working with eight veterinary clinics in Minnesota and Wisconsin. "Working together, the relationship with the veterinarians is phenomenal," he said. There are cases where the animals are beyond help, he said. But many times, he's been able to help even those whose owners feared they would have to be put down. The manipulations help animals feel better, perform better and live longer, LaVallie said. Among his clients is Deb Volk of Andover, whose 6-year-old Weimaraner, Ellie, had a tick-borne disease called anaplasmosis, which affects joints, muscles and nerves that send messages from the brain to the paws. 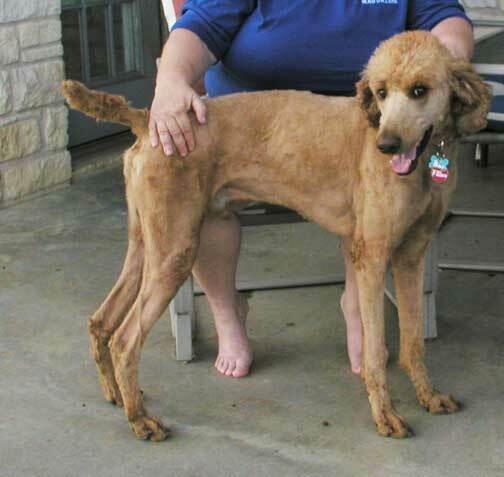 Though she was on intravenous feeding, strong antibiotics and arthritis medicine, Ellie was left with a front leg and back leg partially paralyzed three months after getting sick. "We followed the vet's advice," Volk said. "She got better to a certain point and then no more, and that just wasn't good enough." LaVallie soon found six vertebrae out of place, as well as a pelvis "way of out whack," Volk said. 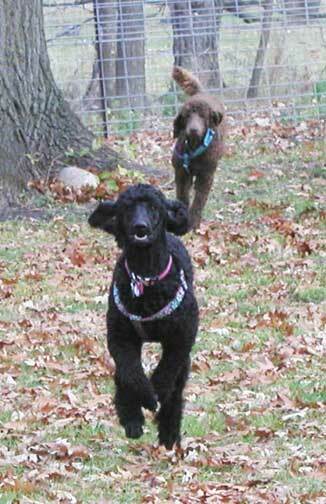 Ellie had weekly adjustments until her spine was aligned, and the Volks did treatments at home. The dog soon began wagging her tail again. 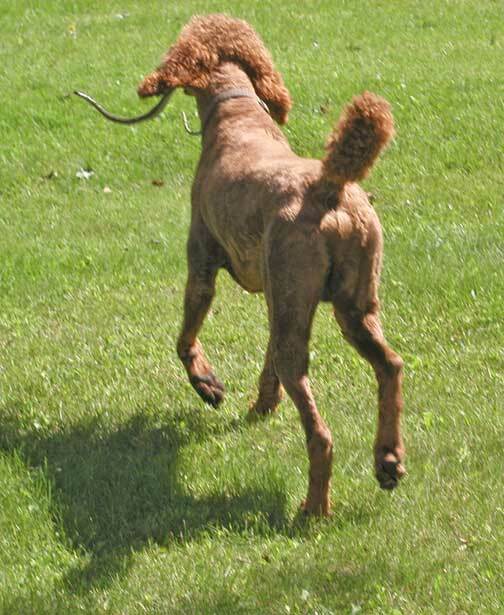 Now, she runs much of the day and is "a happy, happy dog," Volk said. "Dr. LaVallie performed a miracle," Volk said. "He fixed Ellie. It's just unbelievable."